How to get there: The best approach from Athens, is to drive to Chorinth along Hwy. E-94, then take the E-65 north-west in the direction of Patra. Exit left (inland) when passing the town of Xilókastro, the exit sign should say Trikala. Measure from this point. At km 5.3 curve left, go straight at 6.5 (no right), 9.3, and at 14.5 (no left). At kilometer 17.7, turn left, there is a big green sign here. Stay on the main road and go straight at 18.7, 21.1, and 22.3. At km 23.0 turn left, do not head to Karia. 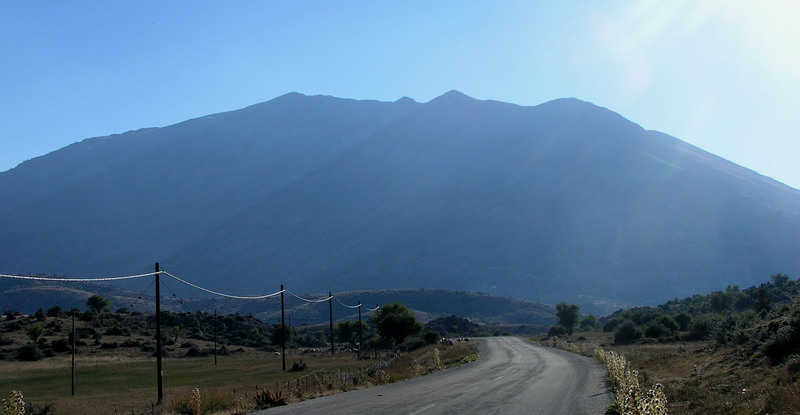 In Trikala, at km 24.5, the road forks, take the left fork and continue for another 10 km. Near km 34.5 the road turns to dirt, the mountain is now right ahead. Curve right where another dirt road comes from your left and continue below the mountain a short distance. Locate the last farm on the lower mountain slope, turn left on a small dirt access road and park out of the way near this farm. Ask the owner for permission if you park close to the buildings. This farm is located at North 37:57.269, East 022:24.828, elevation 1581 meter. If you come from the south, as I did, then things are more complicated since the entire area connects only by smaller dirt roads. I made my way north to the small villages of Gura and Steno on the west side of the mountain. I then took a very obscure and questionable dirt road heading up the slopes from Steno. It is very likely that the corresponding road climbing up from Gura is better. After a lengthy and lonely drive on a very narrow dirt road clearly best suited to 4WD vehicles, and making the wrong turns at an unmarked road fork, I connected with the road from Gura that looked significantly better. A short drive later, I decided to park at the farm described above and climb the mountain from that location. Route description: From the farm, head right on an ascending traverse towards the main (north) ridge that comes down from above. Follow this ridge across a few "false" humps until you find (surprisingly!) 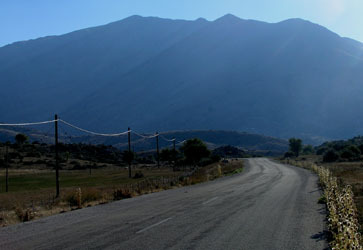 the end of a 4WD road in a small saddle at location N37:56.733, E022:23.852, elevation 2240 meter. Follow this road a short distance, then ascend back on the main ridge to your left. The final climb along the broad and gentle ridge is short and easy. This mountain has several high points along its north to south ridge. Arriving from the north, you will first cross point 2372, N37:56.413, E022:23.797, then a very shallow saddle at 2365 meter, N37:56.385, E022:23.771, before getting on to the highest point at 2374 meter. If you continue south, you first cross a somewhat more distinct saddle at 2281 meter. The dirt road runs through this saddle from east to west. The next peak (south summit) is 2349 meter at location N37:56.131, E022:23.461. An alternative route would be to locate the beginning of the dirt road, then hike this. 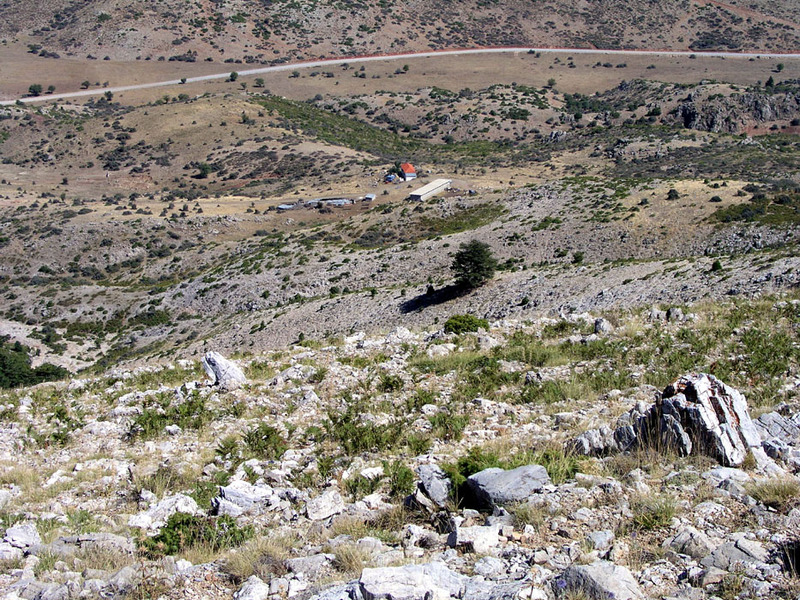 To drive this dirt road would not constitute a proper climb of this mountain. 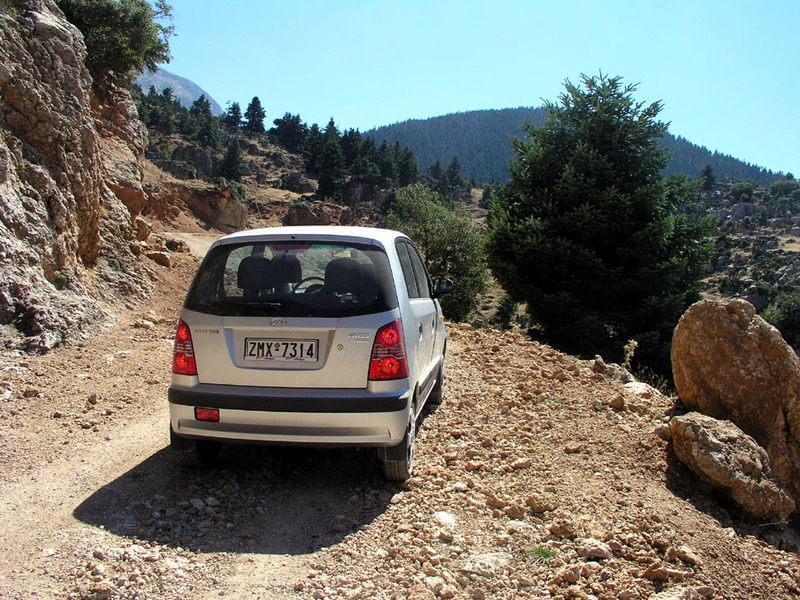 Comments: I had been driving on quite obscure roads from the peak Profitis Ilias that I climbed in the morning. I hoped to be able to also do this mountain and still get back to the conference hotel around the same time as the rest of the conference returned from their excursion. Unfortunately, I had very little information about this mountain. A main objective was to find a road that would put me within a reasonable hiking distance. (My best map being a road map of Greece in scale 1:800.000.) After driving across from the Gura area, I parked and finally headed up the mountain at 1445. The local farmer confirmed that this mountain indeed was Killini and that I could climb it from his farm. I somewhat surprised found the 4WD road near the summit ridge and followed it for a while. I had already crossed several "false" summits and now I saw yet another summit further ahead. I had no idea if the summit up on my left was higher or if the peak ahead was the highest one. There could even be more and higher peaks behind the one I could see. The road map certainly did not provide any clues. I decided to climb the peak furthest away first. From there I could make decisions on how to proceed. I reached this summit at 1615, it turned out to be lower than the one I traversed below, but I had final confirmation that there were no higher peaks further south. Hiking back across the saddle, I reached the Killini summit at 1645. After a short rest and some additional GPS measurements, I returned to the farm at 1745. My Greek trip continued (two days later) with a climb of Dirfis. The Killini massive as seen from the west side. The highest peaks are to the left (north) side. 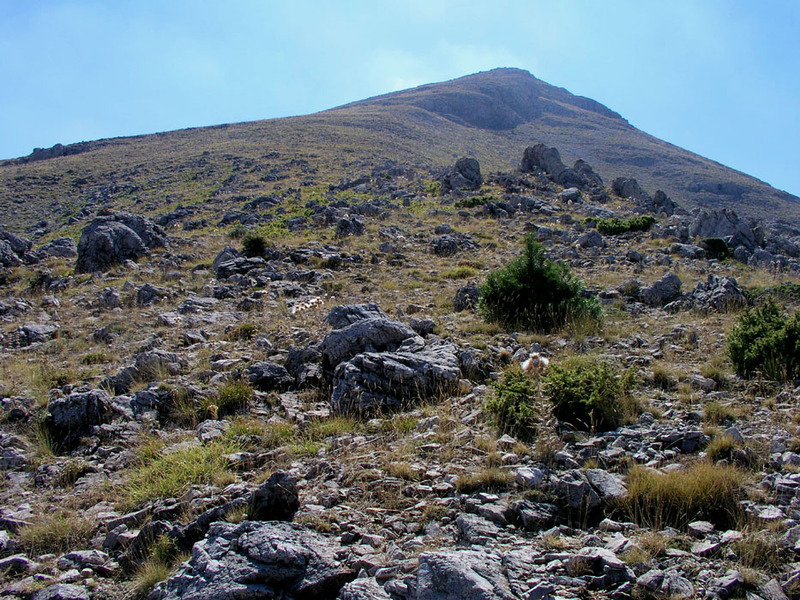 Searching for prominent peaks on Peloponnes. Killini is starting to appear in the far left. It was a bit lonely along these roads.. The farm from where I started. The ridge that I followed up. It was a bit steeper than it looks here. 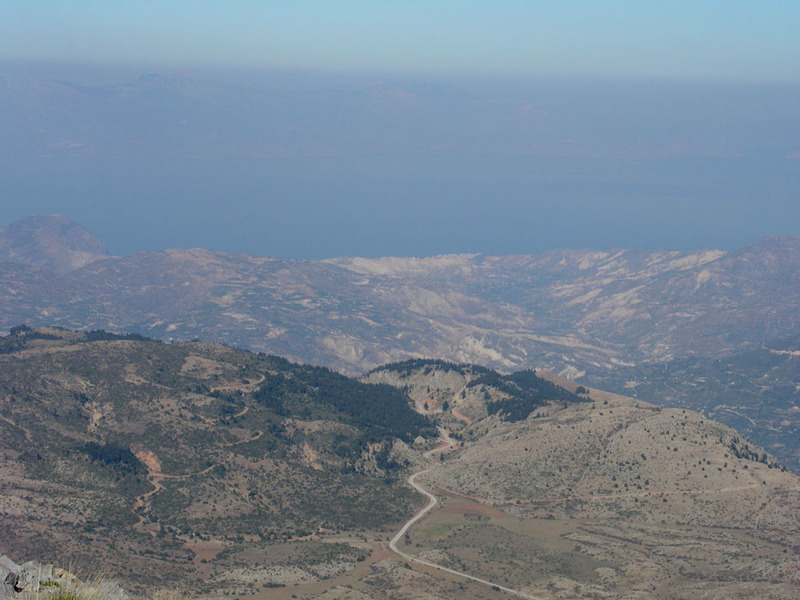 Panorama (east) from the north summit of Killini. The highest point is at the right end of the picture. Panorama (west) from the north summit of Killini. The south summit is at the left end of the picture. The road towards Tikala and the sea. Looking back, Killini in evening light as I drive to Tikala.